Steve Jobs is dead. We mourn his loss. We memorialize him and eulogize his greatest accomplishments. We cull the best we can from commencement speeches and words of wisdom to live a better iLife. We hashtagged the man to death. The man who serves as our cultural touchstone for electronic innovation and democratization is gone. And so we weep. In the colossal wake of remorse and loss Mr. Jobs inspires we might look to Texas based mechanical engineer Justin Jensen for some closure. A sense of hope. A sense that innovation, ingenuity and the American dream didn't die along with the reorganization of Apple's front office. That's a heavy handed way of saying Jensen deserves some attention. And he's getting it in spades. His inaugural product CineSkates appears a simple set of wheels at the base of an ergonomic tripod. A second look reveals the innovation and ingenuity we crave. No, this cowboy didn't invent the camera or the iPhone5. What Jensen and his team at Cinetics did was reimagine the fundamental way we manipulate a camera. That's because Justin Jensen is a problem solver. Justin Jensen knows how to use his imagination. The kind of imagination that made polyurethane wheels and empty pools so important to skateboarding in the seventies. Imagination and innovation of this sort only comes into being when a designer has a deliberate intention in the importance of their ambition and ultimately in the products that ambition inspires. Jensen describes his project with the same fluid movements CineSkates fosters. Crisp tones and understandable terms. Just the right register. He chooses his words carefully. His diction is enviable. Then he answered my questions on his passion for photography, how to fund a project in a day and what video we can't afford to miss in the same sprawling way. Modestly underplaying the magnitude of his invention while indulging in the serene pleasure of answering questions about his set of wheels. When did your interest in film & photography begin? My parents gave me a Nikon when I graduated from college. I don't know how many thousands of pictures I took on that thing. Canon eventually won me over with their video capabilities though! Where did the idea for CineSkates originate? Hmmm, this is hard to pinpoint. I was taking a class at MIT called imaging ventures and I was really interested in moving cameras fluidly. I looked into helicopters, steadicams, you name it, until one day a simple idea hit me ... ultra smooth wheel assemblies on a tripod. Can you describe what CineSkates is? 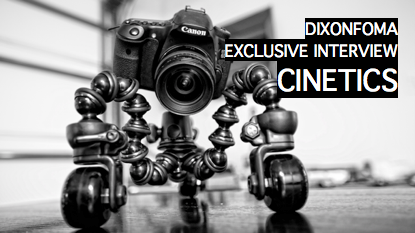 CineSkates are a simple set of three wheels that mount on a tripod and enable fluid rolling motion. Simple as that. They are designed with precision parts that result in some amazingly fluid video. What would an independent film maker previously have done to achieve the same effect? Professionals have used large dollies to get some of the shots that CineSkates can capture, but what is really exciting is that they enable shots that people couldn't get before without some really serious equipment. They can be configured to run down narrow counters and to slide a camera fractions of an inch off of a surface (when you flip the system over, like on the pool table in the demo). Do you find a sense of pride in creating a product that could have such a positive affect on film makers and their work? Certainly, but I'm really excited to see what people do with them. That will be really amazing. Can you describe your decision to use KickStarter as a way to fund the project? I thought about raiding money to launch the product through more traditional methods, but it seemed like it would be easiest to explain it to film makers through KickStarter. I spoke with Pete Dering, the creator of the Camera Capture Clip System, and was pretty sold on KickStarter instantaneously. One of the most amazing things about it is the connection you get with your backers. They really are there to support you and it is great to get their feedback on the product, and, in my case, future products for the Cinetics Connect platform. You reached your original goal of $20,000 in just over a day. Were you anticipating such an overwhelmingly positive response? I was expecting people to like the product, but I certainly didn't expect the response it received. It has been nothing short of amazing. In what way has affordable film making equipment like CineSkates changed the landscape of film? Affordable gear enables many more people to get into film making. People that may not otherwise. This opens the door to new ideas, new creativity, there is only upside to getting more people out working on something they are passionate about! What Vimeo video can we not afford to miss? Wow. That is tough. I'm tempted to say the utterly amazing 'The Mountain' by TSO Photography, but I'll give you a more personal one. My introduction to KickStarter and the first project I backed 'The Whole Gritty City'. Leave a comment or retweet this interview.